“Remember, O most gracious Virgin Mary, that never was it known that anyone who fled to your protection, implored your help or sought your intercession, was left unaided. Inspired by this confidence, I fly unto you, O Virgin of virgins, my Mother. To you I come, before you I stand, sinful and sorrowful. O Mother of the Word incarnate, despise not my petitions, but, in your mercy, hear and answer me.” Amen. My soul proclaims the greatness of the Lord,my spirit rejoices in God my Savior; for he has looked with favor on his lowly servant. The Rosary is a Catholic prayer devotion that draws us closer to Jesus and Mary by reflecting on key moments in their lives. According to Catholic tradition, Mary gave the Rosary to St. Dominic when she appeared to him in 1214. In 1520, Pope Leo X approved it for use by lay people. In those days, many were illiterate, so the Rosary allowed anyone to pray with familiar words from scripture. 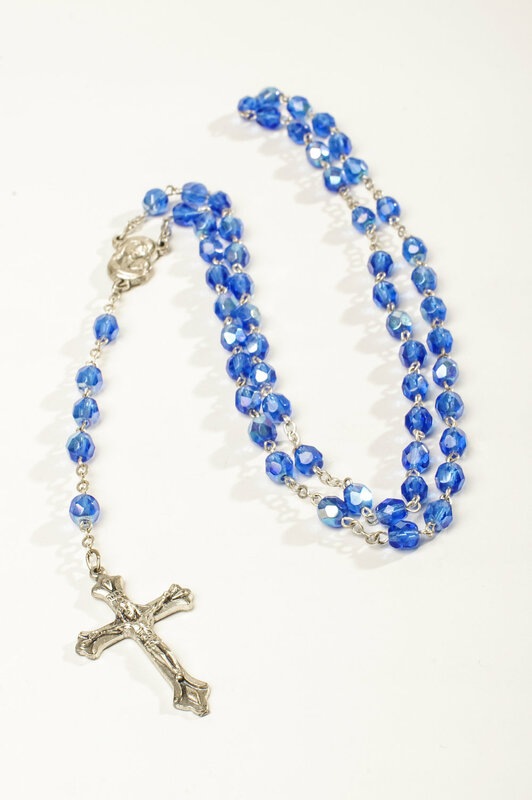 The word Rosary comes from the Latin rosarium, which means rose garden. In scripture, roses symbolize perfection. So, the Rosary is like a perfect garden of prayers. The Rosary involves a lot of repetition. You might be wondering, why pray the same prayers over and over again? Praying the Rosary helps slow us down, calm our hearts, and get in touch with our desires for God. The message of The Divine Mercy is simple. It is that God loves us – all of us. And, he wants us to recognize that His mercy is greater than our sins, so that we will call upon Him with trust, receive His mercy, and let it flow through us to others. Thus, all will come to share His joy. This message and devotion to Jesus as The Divine Mercy is based on the writings of Saint Faustina Kowalska, an uneducated Polish nun who, in obedience to her spiritual director, wrote a diary of about 600 pages recording the revelations she received about God's mercy. Even before her death in 1938, the devotion to The Divine Mercy had begun to spread. The message and devotional practices proposed in the Diary of Saint Faustina and set forth in this web site and other publications of the Marians of the Immaculate Conception are completely in accordance with the teachings of Church and are firmly rooted in the Gospel message of our Merciful Savior. Properly understood and implemented, they will help us grow as genuine followers of Christ. or a full understanding of Divine Mercy, we recommend Divine Mercy Message and Devotion, by Fr. Seraphim Michalenko, MIC. Busted Halo is a media resource that helps people understand the Catholic faith, put it into practice in their everyday lives, and share it with others. Watch to find out more! These videos are developed by Paulist Fathers who believe that modern media can help us live out the Gospel ini today's culture. Like Sacraments 101, or Advent in 2 minutes, or videos about the mass. Engages young, teens and adults.